Since retiring from the rigorous world of business, I have had time to devote my full time attention to animal training. While working as a marketing director for a world wide dental products company, I as able to use such skills as writing, public specking and a wide variety of people management opportunities. Along with raising three daughters and maintaining a household, I found time to enjoy my love of animal training. 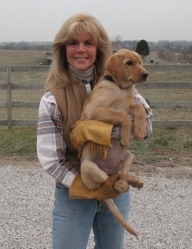 Married to another animal lover and trainer gave me numerous opportunities to train dogs and my first love, horses. After the children were on their own, it was time to retire from the corporate world and devote full time to animal training. Like many others, I started back in grade school with 4H projects. I raised and trained everything from a pig to sheep to horses. Horses have been the love of my life and will always be. However, dogs come in a close second. And, married to an advent hunter and hunting dog trainer, allowed us to enjoy our pastime together. We trained dogs, both hunting and field trial dogs for more then twenty five years. At the same time I trained my own show horses and competed in AQHA shows and more recently in the American Cutting Horse competitions. Since we retired ten years ago, we have worked with drug detection dogs as well as advanced training in all animal behaviors. We have developed our own resistance free technique of training, The Science of Participative Training.” Using all the information we had accumulated over the years of study, we found a stress free training method that allowed the animal to participate and enjoy the learning process.